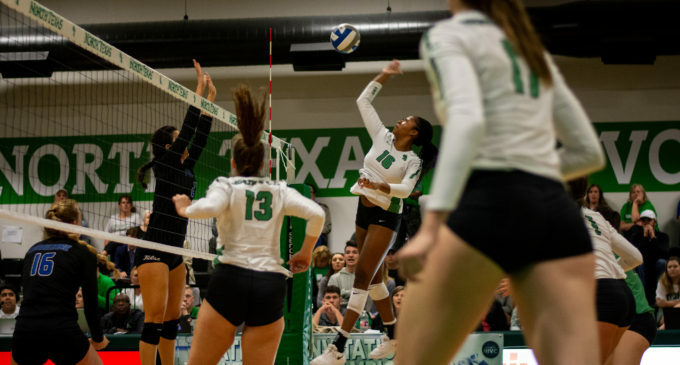 The North Texas Mean Green volleyball season ended after a 3-1 defeat at the hands of Iowa State during the quarterfinals of the National Invitational Volleyball Championship. After starting the season 4-12 in non-conference play, the Mean Green won 11 of their last 14 games to vault their final overall record to 19-17. Senior captain setter Karley York finished No. 4 on the all-time assists list for North Texas (1,361). The Mean Green came to Hilton Coliseum in Ames, Iowa ,for the game. York dove over the bench to try and hit a loose ball back in play during the first set. Three-straight kills by sophomore Valerie Valerian put the Mean Green up 6-4, and as soon as Iowa State narrowed the gap to one point, head coach Andrew Palileo called a timeout. Coming out of the timeout, Iowa State committed one of their five service errors in the first set to give North Texas a 20-17 lead. The Mean Green would keep their lead throughout the first set and win 25-22. Valerian led the way with six kills, while freshman Sara Haeussler added five kills and hit .316 in the first set. However, Iowa State had other plans in the three following sets. In the next two sets, Iowa State went on long runs to deflate the Mean Green. The Cyclones won the second set 25-17 and the third set 25-21. “We struggled the rest of the three sets, and that’s really what it came down to — our first touch,” Palileo said to Mean Green Sports. With North Texas facing a do-or-die situation, Iowa State jumped out to a 10-1 lead in the fourth set. The Mean Green tried to make a comeback, going on a 5-0 scoring run to cut the lead to 11-8. However, the Cyclones managed to finish off North Texas and win the fourth and final set by a score of 25-20. Valerian led all Mean Green players with 15 kills.